And we’re back! We made a note yesterday that not everybody can come back from the World Juniors with a medal, but some certainly can! And part of that group, this year, was the American team, who came home with silver and on which the Flyers were represented by four of their prospects. Let’s jump right into their performances, shall we? Unfortunately, there isn’t a whole lot to say about our pal Jay O’Brien, here, and not because of anything he did or didn’t do, but purely for the fact that he served largely as the 13th forward for much of this tournament, and didn’t get very many minutes of ice time. But, that said, in evaluating his play, I want to drop what’s become one of my favorite Scott Gordon-isms: I had no complaints about O’Brien here. When he was able to get out for a couple of shifts, he was used primarily in a fourth line role, and he did so effectively. He played a quiet game, but that play was sound. Would we have liked to see him get a larger role, particularly after we saw him thriving in a larger role in the Summer Showcase? Absolutely, but between him being hurt some in his first college season, and not putting up positively stellar numbers upon his return, we understand how we got here. We understand how pecking orders work. But the fact that he was there, chosen to represent his country on the highest stage after not being on their radar this time last year? That significant. And we commend him for that. It’s a similar situation with St. Ivany as with O’Brien, then, in that he was used in a limited role in this tournament (in this case, sometimes as a third pair guy, sometimes as the seven), and this doesn’t give us a huge sample from which to pull observations. But we have a couple of things to hit on. As far as his overall play in the tournament, it was solid. He wasn’t terribly flashy, but he was quietly very sound, and seemed to find some easy chemistry with defensive partner Mattias Samuelsson. He also got a look on the power play (read: one shift), which might be insignificant, but might also point to the coach seeing something in him, trusting in his offensive instincts enough to give him a look. But what was perhaps most immediately apparent was that he was making improvements in his game where was most needed. After he was drafted, one of the bigger notes surrounding him was that of his skating being rough. And then he came into development camp and, to my eyes, didn’t look as bad as the narrative had made it sound. And here, he looked a little better, still, which might feel like an insignificant note, but to see him improving on the weak points makes him that much more exciting, as a defenseman prospect who already checks a lot of the boxes. One of our bigger surprises of this tournament was probably Cates—not because we weren’t expecting much from him, but rather because we didn’t know quite what to expect from him. He was drafted from the Minnesota high school system, and has been putting up some decent numbers in his first college season, but he still remained something of an open question for us. That said, he came into the World Juniors, and he came to play. A strong camp earned him a spot on the second line, and he flourished there. Sweden forced a couple of mistakes out of him, but by and large Cates brought a very consistent and sound game. He wasn’t always the most noticeable player on the ice, but he was sure to be taking care of all of the little things in his game. Of course, he did still bring a bit of flash for us, in case we were wanting it. Where he really shone, though, was on the penalty kill. The United States hit the gold medal game with the top penalty kill of the tournament, and Cates was key piece in making this so. They were active in their pressuring and it kept teams from being able to generate a whole lot in sustained pressure, and Cates fit right in in this aggressive system. He did the thing. And also took a step towards putting to bed questions of whether he has much in the way of NHL upside. Somehow a hat trick in the preliminary round to help propel his team to a win wasn’t enough to earn Farabee top player of the tournament honors (yeah, yeah, the US scored a lot of goals, that’s true, okay), but we would be hard pressed to say that Farabee wasn’t one of the most consistent players across his seven games played, even if he wasn’t scoring every night. A few details of his game stood out—his vision of the ice, the quick release that helped get him that hat trick, and the fact that he is positively relentless on the forecheck, and in all zones. But outside of the obvious scoring touch and those details mentioned above, what stands out perhaps the most is the fact that he is just always creating. Even when it doesn’t look like there’s much there, he can make some moves and pull a chance out of nowhere, like this one, where he brought everything but just wasn’t able to quite jam it home. And that’s just… that’s kind of unreal, right? Watch that play again. So what are we getting at, here? 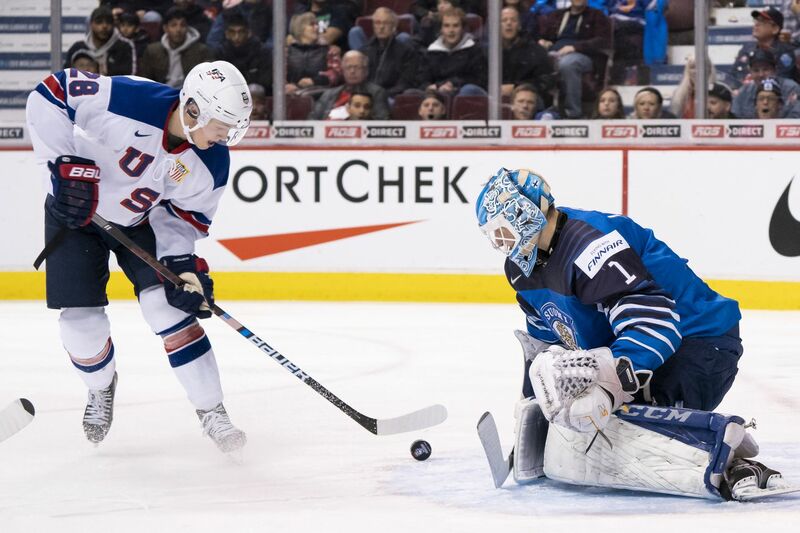 We’ve been seeing bits and pieces of Farabee’s game that has us excited about his potential, and it seems like at every opportunity, he gives us a little bit more to be excited about, and this World Juniors showing was no exception. We’re on the up-and-up here, friends. This is only the beginning.